Mario Lupo, (Bronte 1904 -- 1986), was a professor of natural sciences in Bronte at the Capizzi Secondary school, journalist, interested in politics (was deputy major of Bronte in the years 1970) but, above all, was a great chemist. With remarkable anticipation and insight, in postwar (1950 -1964) he was the first to talk about the oil fields of Bronte and of the island territory (the "Sicily petroliferità" as he called it) and to develop ideas and hypothesis, both flywheel of economic and social growth. 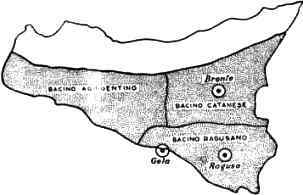 He was also the first to guess and speak of the oil showings of the San Nicola district (the "San Nicola fire") and of the Gioitto zone. ("Idrocarburi in libertà- Bronte oil center", Gian­notta publisher, Catania, 1962). He wrote that "with the name "giuittu", the Arabs indicated the black bitumen. 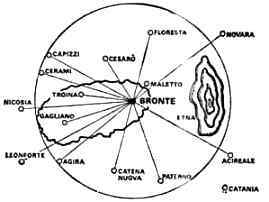 They could have observed signs of hydro­carbon and that could have given the name of Gioitto to this zone?". Already in the 1929, as a solitary researcher, tried to define the oil peculiarity of Sicily ("petro­liferità"): by sending his analysis and the first samples "of certain oil origin" taken by him, to the Sicilian territory to the Experimental Station for the Fuels Of Milan. As a political man, he tried, in every way, to bring to Bronte some economic benefits, deriving from the utilization of the hydrocarbons found on his territory. Despite his studies and the persistent action in searching for the petroleum, remained however, "a prophet in his country", unheeded, having had vulgar interlocutors, not only locally. 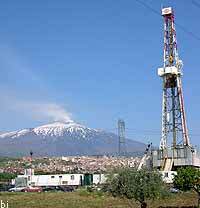 Today the research, the utilization of oil fields, in Bronte and other zones of the island, and the use of methane have became Sicilian realities. In the territory were discovered impor­tant metha­ne fields (gasoline), rich of liquid pro­ducts degasified in a big plant, built, by the E.N.I., at a few kilometers from Bronte. "The petroleum meant a pacific revo­lution; the industrial and economic revolution which would have changed the face of my land; it meant a better future. It meant the revival: it was worth to dedicate my modest efforts of technician to the first professional experience, the first love. And it was, truly a persistent action, searching for petroleum on my own, a composite action that I judged civil and social, among technique, journalism and politics". 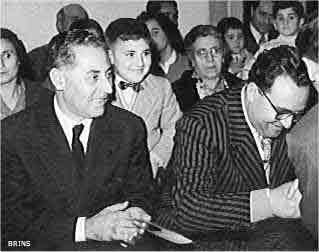 Professor Mario Lupo (left) in 1960. To his right the lawyer, Fortunato Attinà, deputy mayor of Bronte in he same period; in center his son Francesco Attinà. To reach and see his dreams realized by prof. Mario Lupo lavished his energies in a thou­sand ways: books, articles on the columns of newspapers and magazines, letters, peti­tions, proposals, organization of associations and conferences, interventions in public deba­tes, solicitations to politicians of the most varied extraction. Yet, in spite of a total commitment, his greatest hopes were disregarded. «He died without seeing his dream of wellness for Sicily realized - just wait to be picked up by the witness launched by prof. Lupo ", so, a few days after his death, titled La Sicilia on Satur­day, March 8, 1986 in an article signed by the then mayor of Bronte Pino Firrarello. "There are still - wrote Firrarello, among others - those who put their entire lives at stake in the service of an idea, Mario Lupo is a shining example of it". 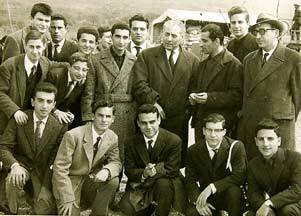 1962: Mario Lupo surrounded by professors and students of Real Collegio Capizzi. "Oil" hypothesis of 1949 by Mario Lupo on a territory of 5.000 square km. 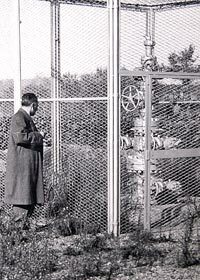 1956: The prof. Mario Lupo next to an active well of methane extraction near Bronte. «When sowing the im­portant thing is that someone picks up. If we do not celebrate the dreamed reality, it will be our chil­dren or grand­children»"(Mario Lupo). 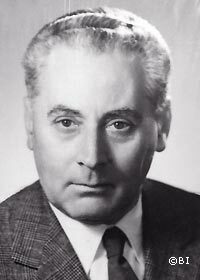 Giuseppe Grassi, was born in Bronte in 1913 and died in Rome in 1980. He began his studies at the Real Collegio Capizzi and, after completing his studies, he soon became a teacher, an internationally renowned surgeon and a scientist. Master of the surgical art in 1977 he was elected president of the Medical School of Rome where he also worked at the San Giovanni Hospital. He was the founder of the "Collegium Internationale Chirurgiae Digestivae" and of the scientific journal entitled "Gastroenterological Surgery". «His attitude towards Gastroenterology in general - wrote one of his students, prof. Marino Luminari - was substantially the result of a great interest in digestive pathology, a field that kept him engaged in a diligent search for in-depth study and improvement of some operating techniques, particularly those for the therapy of peptic ulcer, which he predicted in terms of conservative treatment, the same that will later find its definitive validation with antisecretory and antimicrobial drugs." Another of his colleagues - prof. Prof. Antonio Dauri who replaced him after his death in the presidency of the hospital medical school - recalling the figure of his predecessor called him "good man, generous, honest but above all young" uncontaminated ", enchanted optimist who addressed the problem of teaching with violence , intemperance, the joy of the passion never extinguished that for him had become a mission ». 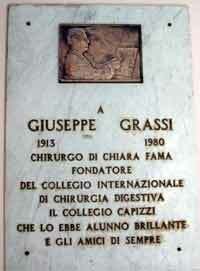 Giuseppe Grassi died in Rome at the age of 67 in 1980. In July 1982, the Municipality of Bronte conferred on him the XXIV Casali Award for Surgery. A street in Bronte was named after him.